The Munro backpack is a long lasting favourite from Berghaus. 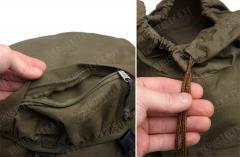 The design has remained virtually unchanged since its introduction, no wonder, this is as close as you can get to the perfect mid-size rucksack! Tough, simple and very versatile. The pictured Atlas rucksack and side pouches are naturally not included with the Munro. 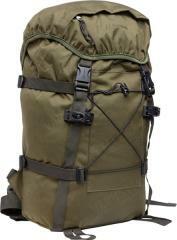 Due to it's compact size and low weight the Munro can be carried in your rucksack and pulled out when neccessary. 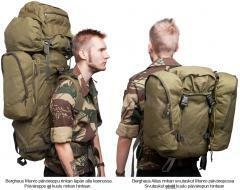 The idea is to provide a daypack to carry what you need for a day or two of Special Forces action. External measurements approx. 52 x 30 x 18 cm. Well padded adjustable shoulder straps. Adjustable waist belt with a sturdy buckle of Berghaus' own design. A main compartment, covered by a flap with two adjustable buckled straps. A small zippered compartment on top of the flap. A flat compartment inside against the back, stuff something in here to give the rucksack a sturdy back. Compression straps on the sides, you can carry the Munro half full without the stuff jumping around inside. 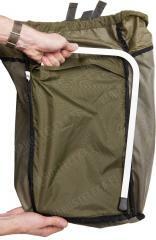 The side straps can also be used for attaching more kit, shelter tarps and such. Padded back with removeable U-shaped aluminium frame inside. Berghaus is one of those brands everybody (probably) knows. Known for their great designs and high quality it is no wonder many militaries all over the world have fielded their packs (or copied the design), ever since the British first humped their rucksacks in fhe Falklands. These days Berghaus produces their stuff in the far east, as does most other big names in the business too. Their very strict quality control ensures that a Berghaus pack these days is worth the old Berghaus reputation, these are still the bombproof workhorses they were 20 years ago! Oikein laadukas ja yksinkertainen reppu. Vertailin tätä ja Centurio -mallia, joka vaikuttaa hieman edistyksellisemmältä. Valitsin kuitenkin Munron, koska sen saa sivun remmeillä kiristettyä särmäksi. Ei heilu tavarat sisällä. Muuten en hirveästi moitittavaa keksi, mutta olkaviilekkeet voisivat olla pidemmät ja rintaremmi tulla samaan hintaan mukana. Päivän reissuille juuri se sopiva. Mukava kantaa, menee näppärästi rinkan läpän alle jotta voi ottaa mukaa pitemmille reissuille päivärepuksi. Itsellä sekä Munro ja Centurio, useammin tämä selkään lähtee. Jos nyt jotain pitää moittia, niin tasku juomarakolle olis hyvä olla, sekä pikkutavaralle jokin tasku repun sisällä. Tosin sellaset kätevä kaveri tuunaa itse, tehdasvalmiit reputhan on vasta aihioita.